Here’s where I’ll be on June 11. I hope you can join me! Featuring a Q&A with director Susheel Kurien (who is also a jazz musician himself) and Michael Steinman, jazz aficionado and writer of the blog Jazz Lives. PLUS get a peek at rare footage of American jazz musicians performing in India! USA, 2011, 73 min. How did jazz from America find a home in India? And how did India respond to it? Filmmaker Kurien tells the untold story that begins with Depression-era African American musicians journeying from Paris to Calcutta and Bombay. This captivating and unique film takes audiences on a richly atmospheric journey into India’s little-known jazz age–which lasted from the 1920s to the 1970s–through a portrait of the maverick guitarist Carlton Kitto, who chose to continue as a be-bop guitarist in the relative obscurity of Calcutta over emigration, commercial studio work, or Bollywood. Tickets: $15 ($10 for students); $20 at the door: call (516) 829-2570, or click here to purchase online via PayPal. The film will start at 7:30pm at the Clearview Squire Cinemas: 115 Middle Neck Road, Great Neck. Visit our website www.greatneckarts.org/Film for more information about the Furman Film Series! Here’s what I had to say about FINDING CARLTON after my first viewing. Even people who are not terribly interested in jazz in the intricate ways some of us are will also find much to admire in the portraits captured in it. And the jazz-fanciers in the audience sat up, enthralled, throughout it. The film concentrates on two musicians: guitarist Carlton Kitto, who found himself entranced by the sound of Charlie Christian on the records his mother played at home while she cooked or cleaned — and Louiz Banks, a Grammy-nominated producer and jazz pianist. Carlton takes our attention and never lets it go, both because he swings delicately yet powerfully, and because he is a sweetly endearing character. Unlike some documentaries I have seen where the story is compelling yet the characters are off-putting, everyone in the audience fell in love with Carlton, his sweet sincerity and his devotion to his music. It did not surprise anyone that when Carlton got pushed on stage when the Ellington orchestra played a concert in India, that Ellington himself warmed to the young guitarist, invited him to sit in, and that Carlton improvised six choruses on SATIN DOLL with the band. I’m only sorry that the Duke wasn’t able to hire Carlton on the spot and take him on tour. FINDING CARLTON is full of the results of the most fascinating archival research, but it is not simply a film for those people whose heads are full of record labels and matrix numbers. The fruits of that research are vivid onscreen, in the photographs, sounds, colors and textures of the Indian jazz scene from the Twenties onward — with quick but telling portraits of deeply inspiring players including the world-class pianist Teddy Weatherford, the elusive trombonist Herb Flemming. The stories Sushiel has uncovered talk of Larry Coryell and Billy Taylor, of Louis Armstrong, Dave Brubeck, of jamming with Sonny Rollins in an ashram. As well as these famous names, we encounter people and players who go straight to our hearts: the first-rate singer Ruben Rebeiro, the devoted jazz fan Farokh Mehta, singers Pam Crain and Christine Correa — we watch the radiance on Christine’s face when she is able to hear a broadcast of her father’s band for the first time, music she heard as a child but never knew existed. Kurien has a splendid eye — even though this is his first film — for the little human details that bring both individual characters and a larger world (now, perhaps no longer quite so vibrant) into focus and into our hearts. FINDING CARLTON blossoms with lovely montages of the present and the past, the aural and the visual, the moving and the still. It is respectful but never dull, informative but never preachy or didactic. I urge you to make a small jazz pilgrimage to see it: it is fully realized, lively, and deeply moving. I came away from it with some feelings of loss: one of the later scenes shows Carlton at a gig in a hotel lounge, playing swing for an almost empty room, but I thought of his resilience and that of the music we love. 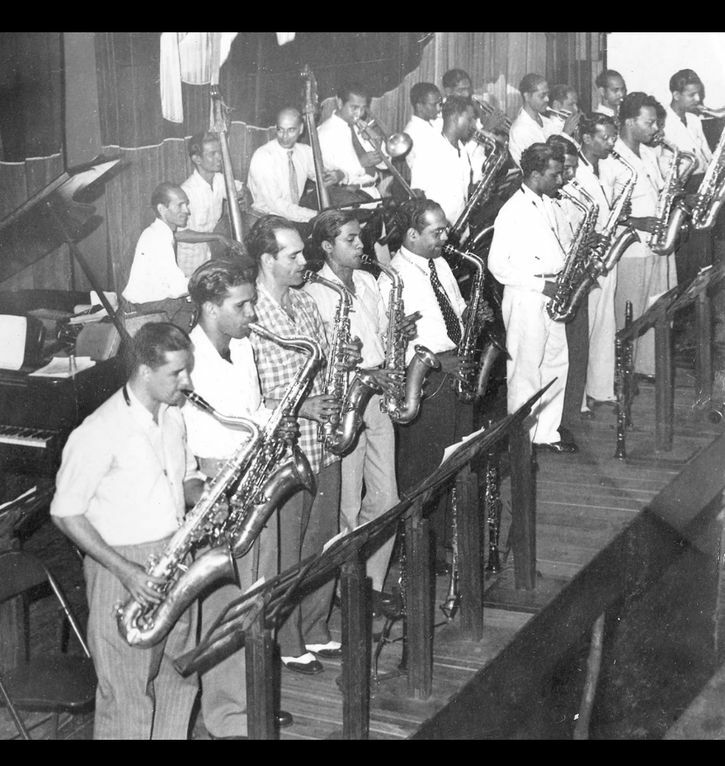 This remarkable photograph was taken in the Fifties — the saxophonists and other players are assembled to pay tribute to Benny Goodman. That in itself would not be unusual. But that the tribute took place in Bombay is a surprise to those who do not associate jazz and India. Through the portraits of a few remaining survivors, it tells the unknown and mesmerizing story of a bygone age of jazz in India. Through archival material and poignant encounters with a maverick bebop guitarist, jazz fans, and other artists, the film uncovers an untold story of cultural cross-pollination: born of pre-war African-American diaspora, American Army presence in Calcutta during the Second World War; and of US State Department sponsored jazz tours in India. The film also illuminates the influence of American jazz on Bollywood. Artfully edited in a rhythmic, multi-layered, warmly intimate and affectionate style, FINDING CARLTON revives the intense power of a largely undocumented jazz movement, weaving memory, concert footage and expert commentary with scenes of moving reunion between elder Indian jazz pioneers. Centered on human chracters with idiosyncratic lifestyles and built around rich archival material including audio, it progressively gathers force to relate the story of an entire Indian jazz generation. FINDING CARLTON is currently in production and welcomes the support of those who would like to help complete this film. Conceived by Susheel J,. Kurien, a Half Diminished Production in collaboration with Chrysalis Films. Thanks to Mansoor Khan for the “Bollywood” scenes from Teesri Manzil, used with permission from the owner. Please contact: findingcarlton@gmail.com for more information. I have to point out that the documentary is indeed artfully done, and it is also the only film I’ve ever seeen to devote any attention to the masterful African-American hot pianist Teddy Weatherford. Tradition is a Temple — a music documentary — asks for your help to show what never left New Orleans. Its filmmakers call for pledges to “crowd-fund” post-production on this musician owned-documentary on New Orleans music culture. Tradition is a Temple highlights the dynamic resilience of New Orleans musicians, acclimated to hard times and dedicated to their city, the way of life, and the music. The artists discuss how, as children, they were inspired to pursue music, the trials of jazz today, and how the traditional sounds of the streets will survive. The non-fiction film aims to show that Katrina, the economic downturn, and the BP oil spill can’t quiet this small, buoyant, and totally unique American sub-culture. After all, children still dance along with brass bands on Sunday afternoon Second Line parades as they have for generations. Filming began in 2006, when director Darren Hoffman was a film-school-graduate-turned-music-student attempting to capture the nuts and bolts of New Orleans music by video taping his drum lessons with prominent local musicians. After several years and hundreds of DV tapes, Hoffman’s “video project” had slowly grown to include intimate interviews with his teachers, multi-camera studio recordings, and live concert footage. That wasn’t all, Hoffman’s passion for the music had evolved into a commitment to his teachers; he gave all of the featured musicians a majority share in the film. The filmmakers are raising money in order to complete the costly post-production process through online “crowd funding”. On sites like Kickstarter.com and IndieGoGo.com artists, filmmakers, musicians and designers can raise significant amounts of money from hundreds of donors, each pledging small amounts of money. Tradition is a Temple offers pre-orders for the DVD and Soundtrack as just a few of the many rewards in exchange for pledging toward their campaign, which continues until Feb. 3, 2011. Featuring: Shannon Powell, Jason Marsalis, Lucien Barbarin, Roland Guerin, Steve Masakowski, Ed Petersen, Topsy Chapman, The Treme Brass Band, The Baby Boyz Brass Band, and spoken word performer Chuck Perkins. Producers: Darren Hoffman, Patrick Stafford, and Kristen McEntyre.